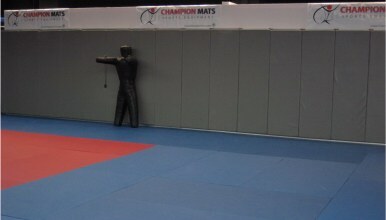 Champion wall pads are an effective means to reduce the risk of injury and a great way to add a touch of class and safety to your gymnasium or martial arts studio. Easily installed by your maintenance department or general contractor and the brightly colored vinyl will enhance the appearance of your gymnasium. All wall pads are manufactured using 7/16" thick wood backing, 14 oz. vinyl, and have a 1" lip at the top and bottom of each panel for attachment to the wall. We recommend using our Aluminum Channeling for mounting our wall pads, but they may also be bolted in place. Please specify color: Black, Blue, Green, Grey, Maroon, Orange, Purple, Red, Gold, Camel, White or Yellow. You may also order a combination of colors. Covered material meets California Fire Marshall’s specifications for flammability. Hardware is not included. Please contact us for pricing on custom wall pads, column pads or cut outs. 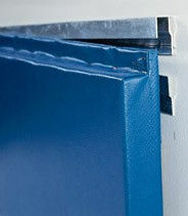 Aluminum channeling is the fastest and easiest method for attaching wall padding to your walls. The wall pads fit into the channeling securely and lock-in at the top for a smooth, neat appearance (no ugly bolts or screws to cover up). Worn or damaged pads can be easily removed and replaced one panel at a time by simply removing the top channel. Includes top and bottom channels.